ONE of southern Australia’s best-known cattle buyers has died suddenly. Paul Weidner from Howlong bought cows at the Northern Victoria Livestock Exchange at Barnawartha yesterday, before passing away suddenly yesterday afternoon. 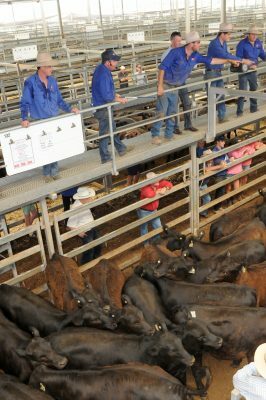 Mr Weidner, who was in his mid- 60s, had attended cattle sales in Wagga Wagga on Monday, and Barnawartha on Tuesday and Wednesday. He acted as a commission buyer and bought up to 70,000 cattle annually for a range of companies and clients. Colleagues and workmates said he had a ‘unique ability’ to assess cattle. Corcoran Parker director Kevin Corcoran said Mr Weidner had being buying cows for company clients at yesterday’s sale and said the news had come as a shock to all. “I would rate Paul as one of the best,” Mr Corcoran said. “He was very quick in his ability to interpret the quality of cattle, and when you are at the fat (prime) sales, the market can move along very quickly. Mr Corcoran said Mr Weidner was part of the well-known Weidner family cattle dynasty of southern NSW. His uncle Alan was also a cattle buyer and Paul took over some of his work when his uncle retired. “Paul started buying cattle as a kid more than 50 years ago,” Mr Corcoran said. Mr Weidner was also a cattle producer and had a property at Howlong. The family had recently bought another property near Rutherglen, Mr Corcoran said. Paull and Scollard-Landmark director Mike Scollard said the long-time cattle buyer had a strong reputation. “He had been buying cattle for a long time and he knew his cattle,” Mr Scollard said. “Paul’s dedication to paperwork, helped out by his wife Fran, was second to none,” he said. “He would go to a cattle sale every day of the week, he would often inspect cattle for us on a Sunday and he would run his farm – it’s hard to know how he fitted it all in but he did, and he did it well. So sad to hear of the passing of Paul, our condolences to Fran and family. Cheryl and I will always have very fond memories of our time in Howlong with the Weidner family. Very sad loss. Paul was one of only a few that survived as a respected cattle man. Paul operated in the Roma Saleyards in the Eighties and as said previously he was the ultimate professional. My sincere condolences to Paul’s family.